Home» Facebook Tricks » [Facebook Trick] How to change your facebook name before 60 days limit? 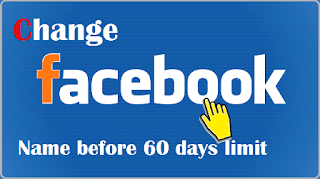 Hello guys, In this post i am going to tell you “How to change Facebook name before 60 day?” Facebook basically allow us to change name only one or two time in 60 days but by using this method you can easily change your name before 60 days. If you also have to change your Facebook account name, then read this post to the last. [Youtube Trick] How To Download Videos On Youtube (All Method)? Step2; First, go to "Settings & Privacy" and click on "General". Step3; Now click on the name option. Step4; Now a new page will open in which some options will appear, click on “let us know”. Step5; Now you will open a page like form that will fill you up. New First Name: You have to enter your new name. New Middle Name: If you want to enter the name then put it, otherwise leave it blank. New Surname: In it you have to enter your new surname. Now select a “ legal name change” option in pick one. You have to upload your document in your id. This is the most important option. You have to upload your original documents. By clicking Choose file you can upload Aadhar Card, PAN Card, Passport, Driving License, Marriage Certificate, Birth Certificate, Voter ID Card etc in the documents. After filling all options properly, click on the send. Now your name will change in 24 hours and you will know the message through. In this way, you can change your Facebook account name even before 60 days limit.